Residents in Beijing, Shanghai and Guangzhou hold relatively little confidence in general society and much more in government agencies, a recent survey showed. The survey was conducted by the Chinese Academy of Social Sciences' center for social psychology studies and was made part of the Blue Book of Social Mentality 2011, which was published by the center on Wednesday. In October 2010, researchers polled 1,171 people in those three cities, who ranged in age from 18 to 60. 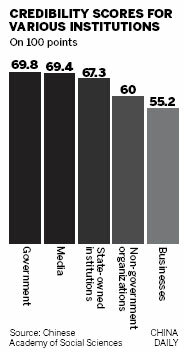 The survey asked respondents to rate the credibility of government agencies, media institutions, businesses and their personal acquaintances on a scale from 0 to 100. In the scores, anything below 50 indicated complete distrust, anything from 50 to 59 a fair amount of distrust, from 60 to 79 a fair amount of trust and 80 and above complete trust. According to the results, respondents in Shanghai placed more trust than the other two cities in general society, which they gave a rating of 65.7. For Beijing, the number was 59.3. The results also showed scores of 69.8 for the credibility of government departments, 69.4 for the media, 67.3 for State-owned institutions, 60 for non-government organizations and 55.2 for businesses. "Generally, I believe the government's words," said Lin Xi, a 30-year-old white-collar worker. "Media reports are sometimes reliable but in other circumstances seem to be fabricated. And most commercial ads are nothing but lies." Yang Yiyin, an author of the report and a researcher with the center for social psychology studies, said the survey only aimed at measuring social trust, not at revealing the reasons behind it. "All these analyses are only projections," she said. Also garnering low rankings were education institutions, which were given 67 points, and healthcare institutions, given 58 points. As for businesses, commercial banks received the best evaluation, winning 74.4 points, while drug producers and food producers were believed to be untrustworthy. Survey respondents showed much trust toward their relatives and friends and little faith in their colleagues, neighbors and online friends. Will US and Pakistan break up? Laden pics 'gruesome'? Remember Zarqawi? Stealth Black Hawk : Radar-evading version is vulnerable? Can Syria survive the crisis?